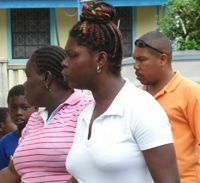 Roberts and her eight-year-old son were before the Serious Offences Court on Friday, February 20, when Prosecutor Inspector Nigel Butcher asked the court for a three-week adjournment so that he could hold discussions with Director of Public Prosecutions (DPP) Colin Williams in relation to the case. This request was greeted with very strong objection by defence counsel Joseph Delves, who told the court that Ophelia had suffered tremendous fallout at her place of employment due to the charges she was facing. âWe are vehemently opposed to any further delay,â Delves said. He even suggested that the case be stood down to allow the Prosecutor to confer with the DPP, who was in the court for a different matter. The charges pertain to a .22 revolver which was found at Kingstown Government School on Monday, October 15, 2007. Robertâs son attends that school. He accused the Prosecution of abusing the process of the court. As she made her ruling making March 13 the final date of adjournment, the Chief Magistrate reminded the prosecutor that the matter doesnât just affect Ophelia Roberts, but also her son, who stood in his uniform next to his mother in the defendantâs box in court. âWe are not just dealing with an adult. We are dealing with a little boy,â she said. Ophelia Roberts is currently on $14,000 bail and is charged with the possession of a .22 revolver, 95 rounds of .22 ammunition, two rounds of 7.62 ammunition, and 10 rounds of other ammunition, all without a licence.